Have you ever removed your glasses and noticed the tell tell indentations on each side of the bridge of your nose? It screams I wear glasses. It's like footprints on your face. Well, about a month ago I was admiring myself in the mirror, preparing for my selfie. (Just kidding.) I noticed the footprints and decided right then and there, I was getting myself some contacts. The footprints had to go. I promptly swiped my ophthalmologist on my Samsung Galaxy and wrangled myself an appointment. I had my eye exam and was given a prescription for glasses and a return appointment to meet my contacts. 7:30 in the morning I arrived at my Ophthalmologist's office before my shift at work. "Have you ever worn contacts?" he asked. "Well, no. I've never even thought about it until those unsightly prints showed up on my face." "You need to make another appointment for a day when you don't have to work. You're going to need a lot of time to learn to put them in and take them out," my doctor informed me. My face fell along with my mood. "No. I can't," I protested. "I work everyday. I need these contacts. Those glasses can't rest another day on my nose." I guess he felt kind of sorry me. His head shook and his lips turned upward. I think he had an inward laugh at me. "Have a seat," he told me. Off he went to the secretary's office and returned with the package I so desired. The contacts. They were in disposable liquid filled containers. He peeled the lids back. I watched feeling as if a million dollars was headed my way. My heart did a little happy dance. "Wash your hands," he told me. "Always wash your hands before handling the contacts." He sat a mirror in front of me. His finger disappeared into the liquid and emerged with a clear contact balanced on it's tip. I stared at it. What was I suppose to do with it? It wasn't long before I learned. 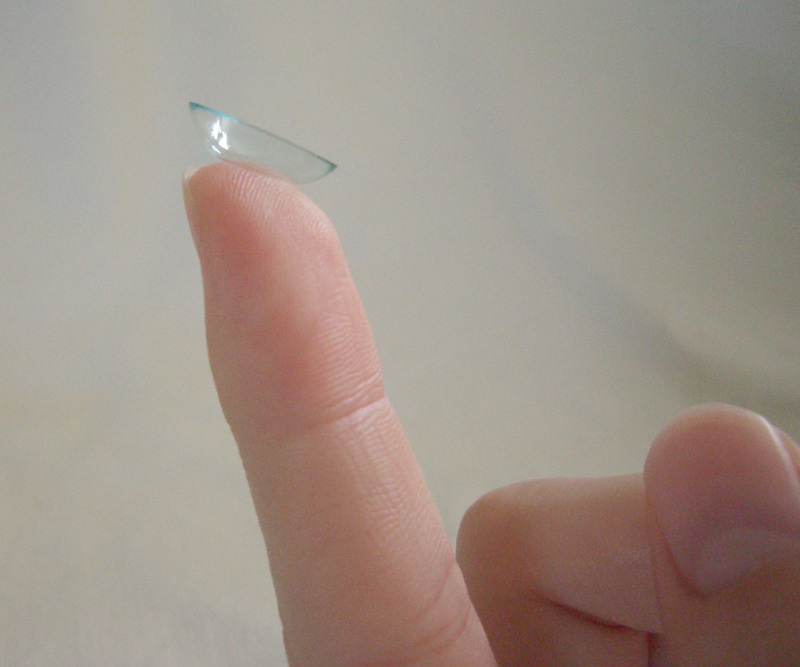 He transferred the clear lens to my index finger of my right hand. He said, "Use the index finger of your left hand and pull your top lid upward. Place your second finger of your right hand on your lower lid and pull down." As I listened, I was thinking, isn't all this pulling going to stretch my delicate skin above and below my eyes and lead to wrinkles? He didn't hear my thought and just went on, "Keep your eyes open and look at the lens. Press it in." Press it in. I'm afraid to put eyed drops in my eyes. How was I going to stick a finger in my eye? Well, he left me sitting there with the contact balanced on my finger and my face in the mirror. A paper towel lined the desk where I was sitting just in case the tiny, clear lens fell. I tried hard to press it in. I really did. It took forever. The contact dried out. I called to him and told him so. He came back. Dipped the contact into the liquid. It has to be moist when you put it in your eye. He left me again. Alone. I was determined. It paid off. I looked my eye in the mirror. I didn't blink. I pressed the clear lens on my iris. I was excited it stayed there. I got it in, but it sure felt uncomfortable. I told my doctor this also. He said, "You have to get use to it. It will take some time. Give it a week." The left eye was easier. It went in without a fuss. I felt like a pro. My doctor came back. "Did you get them in?" I blinked a smile at him. I was as proud as if I had made it to the top of Mt. Everest. Just as quickly as I made it to the top he blew me back down. "Now you have to pinch them out." What did he mean pinch? I felt a little queazy. I hadn't thought about that. "Couldn't I just leave them in for a week and come for another appointment?" I dared to ask. "Nope and nope. I want you to take them out every night and put them in every morning." He was really testing me. I was deflating by the millisecond. I sat back down and began to try to pinch the clear lenses out, the one's in my eyes that I couldn't see. The right one was just as difficult to remove as it was to get in. The left was my friend. My left eye loves me. I proudly announced, "I did it. They're out. What do I put them in?" The container in front of me disposable, no lid. I definitely was not going through the trauma of putting them in again, so I thought. Ha, ha, ha, the last laugh was on me. "You have to buy a contact lens care kit. You need the lens case to put your contacts in," he informed me. "Aren't you going to give me one?" I felt a little panicky. "Do I look like the CVS to you?" he asked. He was still having a grand time with me so early in the morning. "Stop at the CVS. Get a kit. Take the contacts out at night. Put them back in in the morning. Call me in a week." I sat back down at the desk, in front of the mirror and gave it my all. The right took a few tries but not as many. The left eye loves me. It went in on the first try. "Suppose my eyes feel dry during the day?" I asked. He gave up a couple samples of eye drops. He let me know I could get those at the CVS also. After work I went to the CVS. That was priority. I had to get the little clear things out of my eyes and I needed somewhere to store them. I found the aisle and began pricing the kits and the bottles of solution I would need. A clerk asked if I needed help. Yes I did. What am I suppose to buy and how much. She helped alright. I would need a lifetime supply of solution to clean and store my lenses. I would need eye drops just in case my eyes were irritated or a little dry. My kit came to around $14 for the case, solution and eye drops. So now instead of buying food for a pet, I'm buying solution for contacts. It takes a lot of patience for contacts. You need extra time in the morning to put them in before work. It's another step in the morning ritual. Don't think too harshly of my doctor. I worked with him at the out patient center. He's a gem, quite entertaining. He's definitely not a stuffed shirt. He just says whatever. I just wanted you to know that if you're contemplating contacts, it's a commitment. They don't go on and off as easy as eyeglasses.